Aphids are a gardener’s worst nightmare. Regardless of what you grow these small, soft-bodied insects can invade your plants and multiply quickly. In one season alone, many generations of aphids can live. On a positive side, aphids characteristically move quite slow so they are relatively easy to control get under control. Aphids are extremely tiny and are usually not visible to the naked eye. They can be a large variety of colours including white, black, brown, gray, yellow, light green or even pink depending on the species! Their bodies are pear-shaped and they have long antennae. 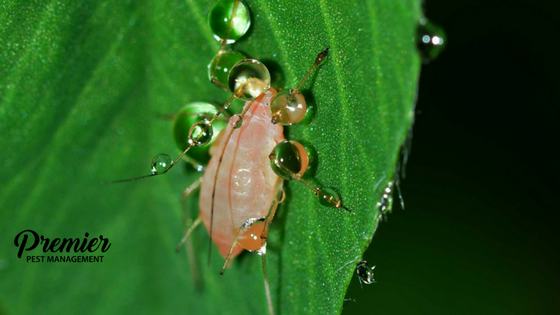 Most species of aphids have two long tubes projecting from the end of their bodies. Adult aphids are typically wingless; however, they can develop a winged form when populations become overcrowded. When food quality begins to suffer in the area they are feeding, they will move to other plants to reproduce and start a new colony. Aphids generally feed in large groups. Typically, aphids are not picky and will feed on a wide variety of plants, however, there are some species that are more specific. Some types pf aphids prefer beans, cabbage, potatoes and more. Residue of a sticky substance. Aphids leave behind waste, called honeydew, from feeding that can attract other insects to your plants. Black leaves or branches. Sooty mold is caused by honeydew being left behind to develop fungal growth. Plant some catnip; it repels aphids. Planting mustard and nasturtium. Aphids are attracted to both these plants and they can be encouraged to feed on them instead of other plants. Plant garlic and chives near lettuce, peas and roses. Purchase ladybugs, lacewings or parasitic wasps to release in your garden to feed on aphids and control populations. If you suspect an aphid infestation, give us a call to learn more about our pest control options and preventative measures!